Emergencies come up when you least expect them. 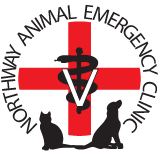 We are fortunate to have 2 veterinary emergency clinics in the area. These clinics have veterinarians, technicians and assistants staffing them overnight and during the weekends and holidays. This staffing allows them to deliver a high level of care throughout the night. With our schedule of daytime appointments, we cannot offer that level of care when we are not open. For problems that seem life-threatening to your pet, we ask you to go to one of these clinics. If the problem is less than life-threatening or if you have a general question, call our number, 518-695-6953, and leave a message for the next day. Click on the logo of the emergency clinic for their map and directions webpage. Directions: Exit 17N off from the Northway (I-87) onto Route 9N. Look for the big red sign and take a left onto Fawn Road. We�re right on the corner, and across from Dunkin Donuts. Address: 222 Troy Schenectady Road (Route 2) Latham, NY. Cross the Hudson River to I-787. From the North take I_787 South and from the South take I-787 North. Get off at Exit 8 (23rd Street, Watervliet). Follow the signs to US Route 2 West. Go 2 miles and we are on the left just past and across the street from the Stewart's Shops.There is a middle turn lane for easy access.